What did you do when Felix Baumgartner did his jump? I was personally putting my girls to bed, but as soon as we could, the whole family watched a You Tube Clip of the jump and it really made us all exhilarated and inspired! If this doesn´t tell you that life is short and one have to put all effort into living to its fullest, I don´t know what will! When I saw him stand up there on the capsule, looking down, I felt humbled beyond belief. What bravery, what courage and he made it! 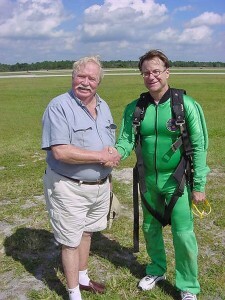 And I thought about Joe Kittinger who had done a jump as extra ordinary 52 years back in time. What did he think? Amazingly enough my friend James M Clash sent me this great article, fresh from his note book, for you readers to enjoy! 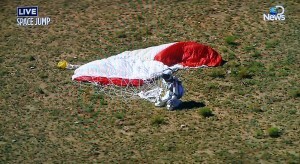 Yesterday Felix Baumgartner broke Col. Joseph Kittinger’s 52-year-old parachute world record and lived to tell the tale. He also became the first person to go supersonic without an aircraft. 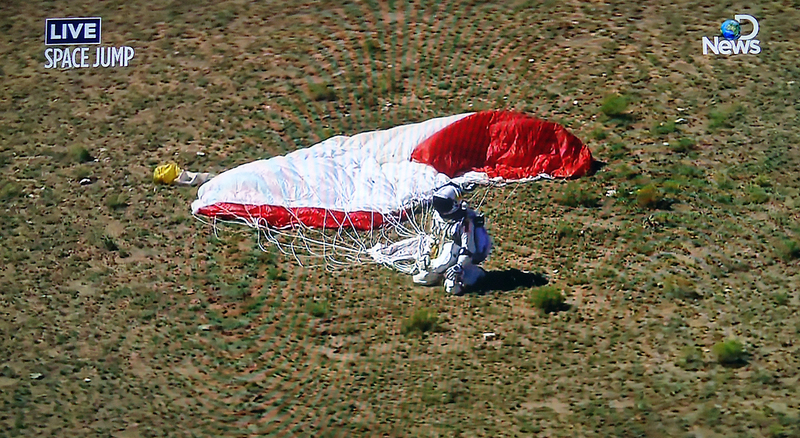 The Austrian skydiver, outfitted in a special pressure suit, rode a helium balloon to 128,100 feet above Roswell, New Mexico, and jumped from his cramped Red Bull Stratos capsule gondola. In less than a minute in the near-vacuum of the stratosphere, his body accelerated to 833.9 mph, faster than sound. 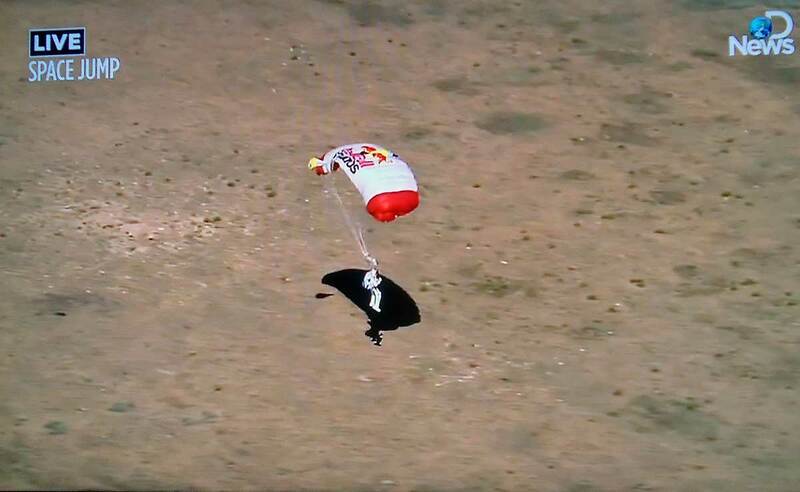 After more than four minutes of free fall (and after slowing by friction in the lower troposphere) he deployed his parachute and coasted safely to earth. Baumgartner, 43, had trained extensively for his spectacular jump. In addition to past stunts – including a 1999 BASE jump from the Christ the Redeemer statue in Rio de Janeiro, Brazil, and a 2003 solo flight over the English Channel using a jet-powered wing – he already had survived two high-altitude parachute jumps this year, from 71,581 feet in March and from 96,640 feet in July. Baumgartner isn’t the first to take a shot at Kittinger’s record, set in 1960 by the U.S. Air Force to determine whether humans could survive ejection from high altitude in a spacecraft. A handful of others had tried, all unsuccessfully. 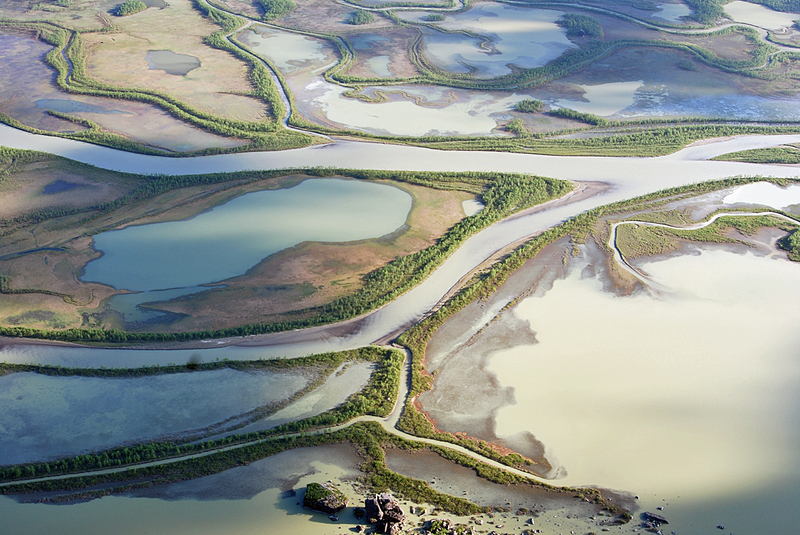 The most recent, in 2008, was Frenchman Michael Fournier’s reported $20-million project in Canada’s Saskatchewan province. But before Fournier could board his balloon for ascent, it malfunctioned and flew away. 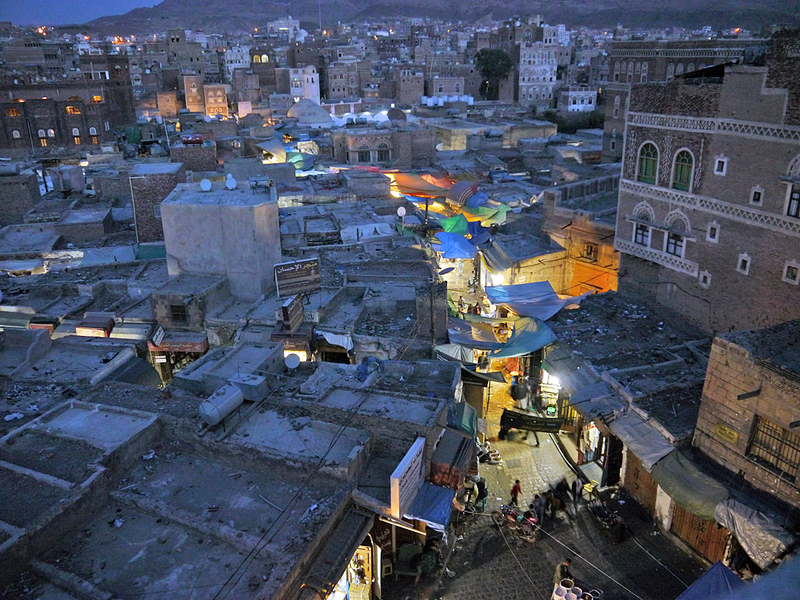 This year has been particularly good for the private sector in its attempts to equal or break old exploration records set by the government. In March, Titanic director James Cameron equaled U.S. Navy Captain Don Walsh’s 1960 dive to the deepest point on Earth, seven miles below sea level in the Mariana Trench. Then in May, and again a few days ago, Elon Musk’s SpaceX challenged NASA and became the first private rocketeer to send cargo to the International Space Station. 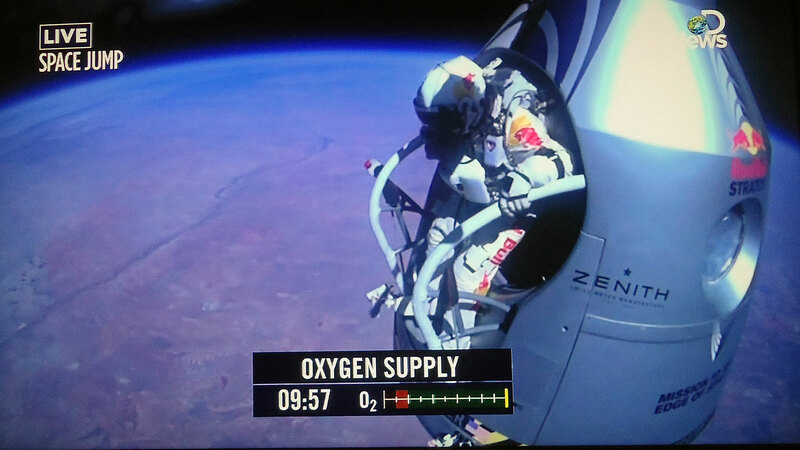 As high as Baumgartner went, he did not jump from space, as some reports have suggested. That is defined as 62 miles (about 327,000 feet) above sea level. Still, 24 miles is above 99% of the earth’s atmosphere, making the view up there otherworldly, and the environment extremely dangerous. When I interviewed Kittinger about his jump, he described a surreal setting. I met Baumgartner a few years ago when the Stratos project was in its early stages. Though often called a “daredevil,” like many great adventurers he seemed just the opposite – cautious, quiet and methodical. We discussed his leap from the Christ statue. He said that the acceleration calculations and science were the easy part. He knew he could do the jump safely. The harder aspect was sneaking up to climb the statue at night without the Brazilian police grabbing him. Baumgartner also told me his biggest fear about the 128,000-foot parachute jump was spinning out of control, something most people don’t think about. He had to be very stable when he left the gondola capsule because, in a vacuum, any spin or tumble could accelerate during free fall. And, if he spun too fast, all kinds of awful things might happen – including vomiting into his pressurized suit, which could affect his breathing and vision – or a blackout, even more dangerous. None of that happened Sunday, but Baumgartner at one point did start tumbling and had to use the experience of more than 2,000 jumps to control it. Like the astronauts, Baumgartner was also at the mercy of his sophisticated equipment. 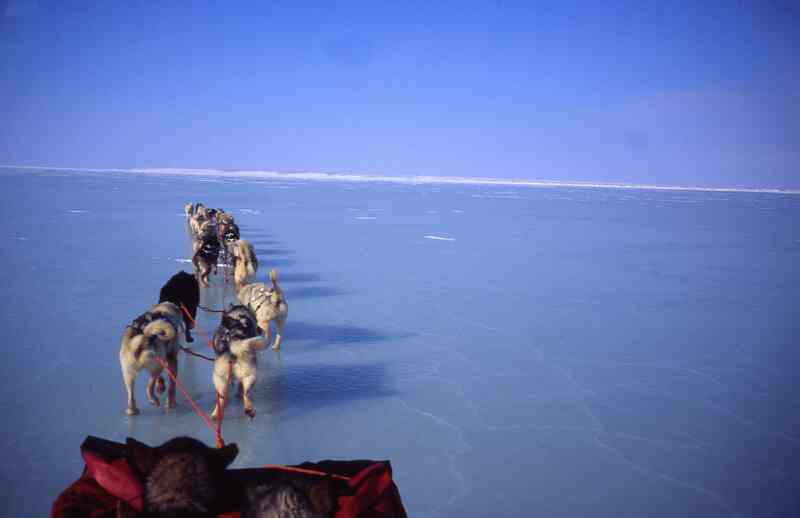 Unexpected things sometimes happen in hostile environments. On Kittinger’s jump, for example, there were problems with his pressure suit. 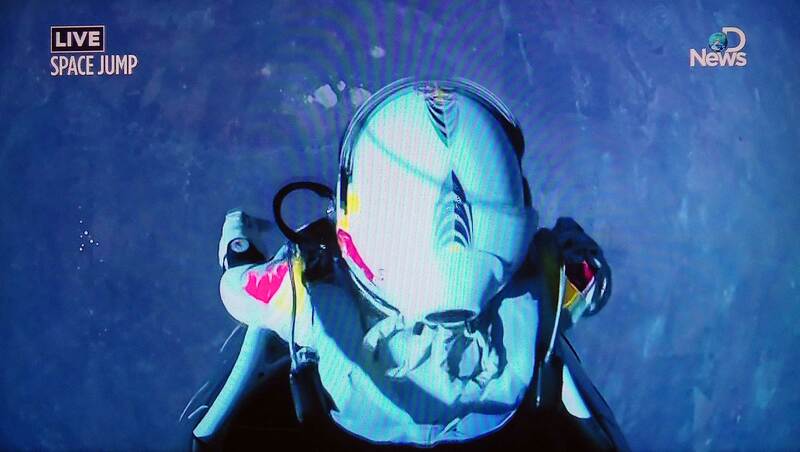 With Baumgartner’s jump, it was a helmet face-plate which seemed not to be heating up as he ascended. In the end it worked fine, but caused some initial concern. For the record, Red Bull had been stingy about granting interviews with Baumgartner and the Stratos support staff ever since the 2010 potential lawsuit from Daniel Hogan, a California promoter who claimed he had first suggested the idea to Red Bull. After protracted negotiations with Hogan, the suit was settled out of court, but it had forced a long hold on the Stratos project. 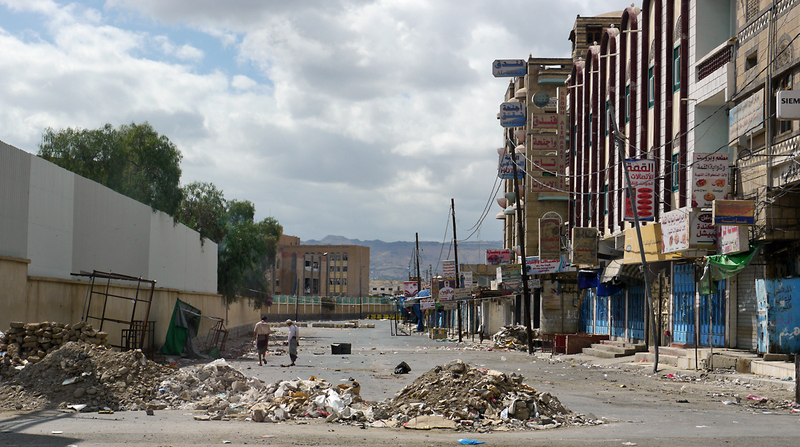 Some journalists became frustrated by the interview “embargo,” including me. Part of the reason probably was exclusive arrangements with BBC and other media documenting the full story. But it also was likely due to the very real dangers involved – and the absolute focus and attention to detail required by the Stratos group, especially Baumgartner. What did Col. Kittinger, now 84 and a consultant to the Stratos project, think about Baumgartner’s chances before the jump? Indeed. Congratulations, Mr. Baumgartner. We are all elated. Joe Kittinger together with James M Clash. James M. Clash is author of the e-book, “The Right Stuff: Interviews with Icons of the 1960s” [http://www.askmen.com/e-book/jimclash/] (AskMen, 2012). A rare interview with Col. Kittinger is included in the book. James has also written an excellent article called A Leap Of Faith here!